Residents in Chesters think flashing signs should be installed. Residents of Chesters, near Bonchester Bridge, are calling on Scottish Borders Council to do more to tackle speeding in their hamlet amid claims that new road markings have not worked. After years of waiting, white lines and ‘slow’ signs were recently painted on the A6088 Carter Bar-to-Hawick road on the approach to the crossroads next to Southdean Hall. However, residents say that has made no difference to the excessive speeds at which many vehicles approach the junction, the scene of a three-vehicle crash earlier this year. At last week’s meeting of Southdean Community Council, members reiterated calls for speed tests to be carried out in the village and asked for electronic flashing signs to be installed. Hugh Roberts said: “The council has repainted the white lines and the ‘slow’ signs on the road, but it hasn’t made any difference. A traffic survey was carried out on the A6088 in the village last October after residents said that speeding motorists and inadequate road markings were putting lives in danger. However, its results have been deemed unreliable as the week-long study took place while roadworks were being carried out. 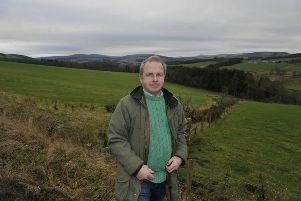 Scottish Borders Council has agreed to repeat the survey, but the community council does not know when that will happen. David Skinner said: “Something needs to be done to slow traffic down as it is a very unusual set-up in that the main road is an arm of the crossroads and not the cross road. “There was an accident at the corner recently where, as far as I can tell, a vehicle coming from the Carter Bar went straight across the crossroads. Residents have been calling for people to stop speeding through Chesters and for improvements to the road markings at its main junction for years. However, Stephen Fotheringham believes that some progress had been made. “Things like the lines being painted, even if on their own they don’t make a huge difference, cumulatively they do, and it sends out the right idea. It is a step forward,” he said.